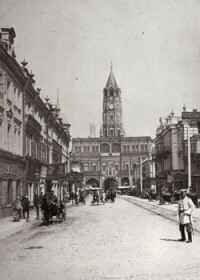 Okhotny Ryad is a very old Moscow district, it can be translated into English as "Hunter's row". Long time ago there used to be a small hunter's market here trading in game and poultry that gave the street its name. Both pictures were taken in the same spot but it would be hard to recognize the area. 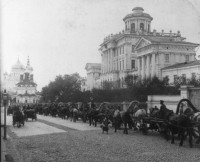 The whole district was completely demolished in the 1930s. But if you watch closely you can still find some buildings that have survived. 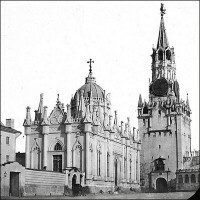 In the very center of the both pictures you see the gates crowned by two octagonal hipped roofs. 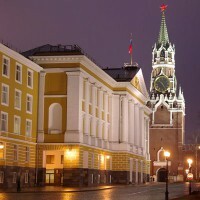 This is the Resurrection Gate, the old entrance to Red Square. 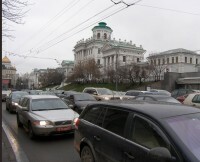 To the right of the gates we see the Historical museum. 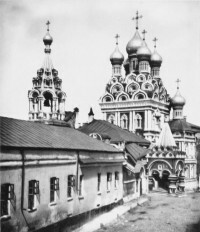 In the recent photograph it is a red building in the center; in the old picture we can only see its left turret next to the Resurrection gate. 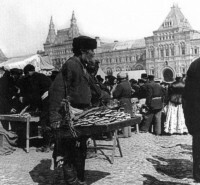 Before the Revolution Okhotny Ryad was famous for its shops and taverns, the Russian writer Gilyarovsky described it as "Moscow's belly". 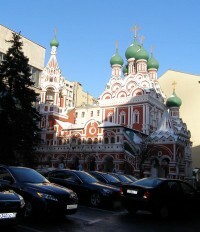 Some restaurants and taverns here were famous all over Moscow. 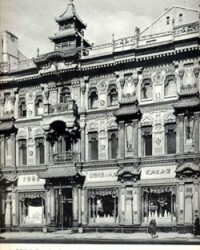 Muscovites came here to indulge in the best starlet pasties, young pork with horseradish and sour cream, pancakes as well as to spend hours talking and having tea. There used to be many small shops here. 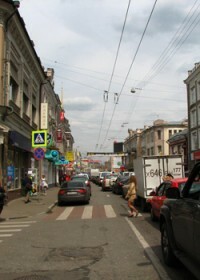 In the old picture we see a meat and fish shop on the left and a dentistry on the right. 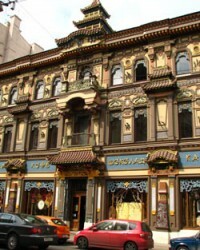 There were a few famous hotels in Okhotny Ryad. 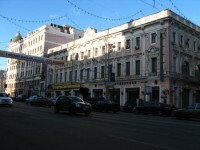 One of them is the hotel Loskutnaya (the second to the right in the old picture), which was especially popular among Russian writers. 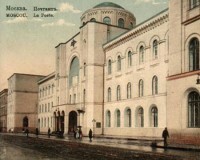 Among its guests were Bunin, Tolstoy, Dostoevsky, Esenin, Paustovsky. In the mid 30-s the whole area was reconstructed. 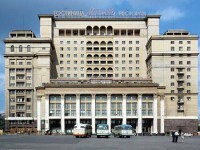 Soviet bulldozers tore down the whole area, a few years later a metro station was opened here. 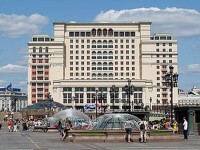 In the same time a new Soviet hotel was under construction. It was called the Moscow. 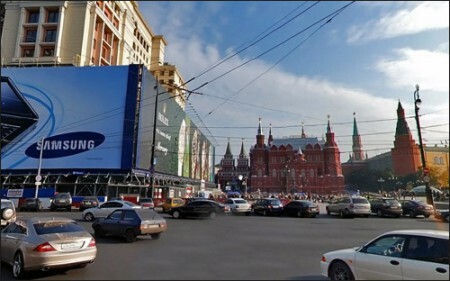 In the future (in the 2000s) it would be closed, torn down and a replica would appear on the same place a few years later. 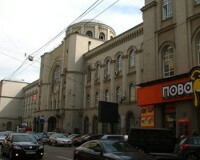 This is a big light building we see today in the new photo. 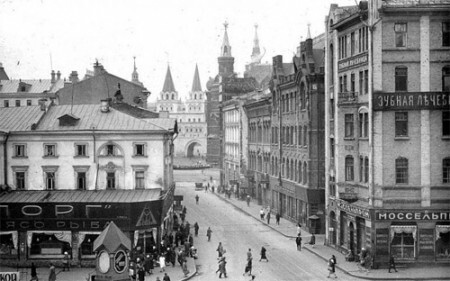 A lot of Moscow history can be learnt only by studying old pictures. 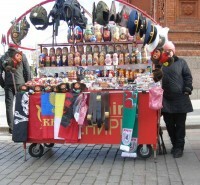 During your Moscow tours you'll have a chance to learn about Moscow of the past and compare it to the modern city.